These are a fun, bite-sized way to serve up a cheesesteak sandwich to your guests, without all the mess and, you know…sandwich. I took all the components of a cheesesteak and essentially turned them inside-out. This recipe is easy to make, the filling freezes perfectly, and it’s a sure crowd-pleasing concept for something like gameday, when you want a no-frills spread for everyone to munch. Preheat oven to 375 degrees. Place the mushroom caps on a rimmed baking sheet, with the indentations facing up. In a large skillet over medium heat, saute the ground beef, onions, and peppers in the olive oil until the beef is thoroughly browned and the vegetables are soft. Turn off the heat and add the cheeses. Stir thoroughly until the cheese is almost totally melted; add the breadcrumbs, salt, and pepper, and mix until everything is fully combined. At this point, you’ll want to taste the filling — it may need more salt or pepper, depending on how salty your cheeses are. Spoon the filling into the prepared mushroom caps, packing it down with the back of a teaspoon. You want the mushrooms generously filled, with a small mound of the filling on top of each. In a dry skillet over medium heat, melt the butter and add the final 1/2 cup of breadcrumbs. Stir until the crumbs are evenly coated with butter. 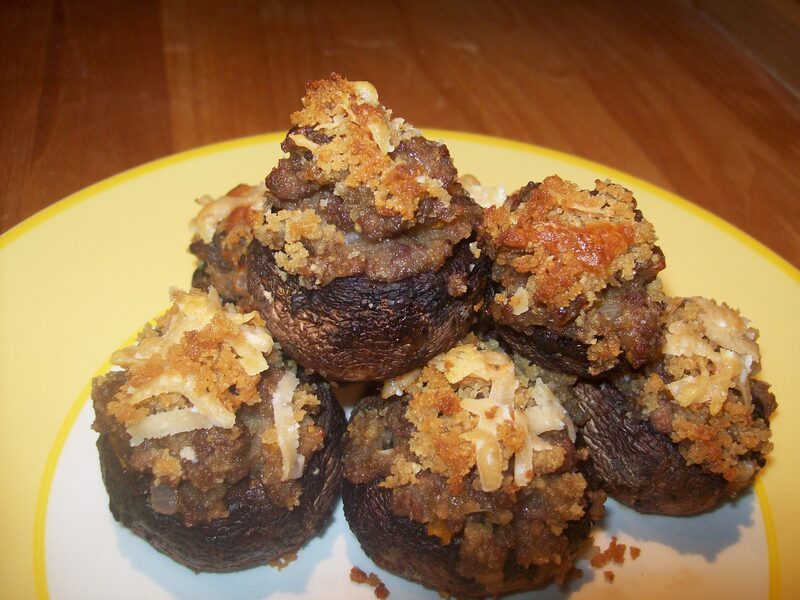 Sprinkle the buttered breadcrumb mixture evenly over the tops of the stuffed mushrooms, then grate more Parmesan over them. Bake the mushrooms at 375 for 15-20 minutes, until the mushrooms are softened and the topping is lightly golden brown.